The combi touch combines ultrasound and air polishing in one unit – it allows complete prophylaxis treatment from removal of supragingival and subgingival calculus to gentle removal of stain and biofilm and even implant cleaning. 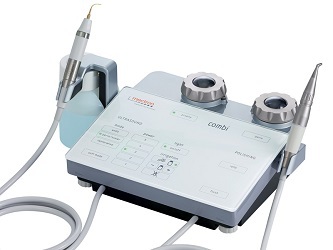 The ultrasound of combi touch operates according to the piezoelectric principle. The inserts apply planar backwards and forwards vibrations, shifting the tartar gently sideways. The patient does not feel any unpleasant hammering movements on the surface of the tooth, and the dentist can work more easily and in greater comfort. 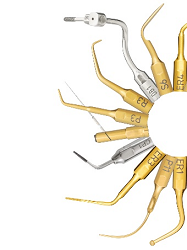 Scaling, perio, endo restorative dentistry – the combi touch can be used for an extraordinary variety of applications. 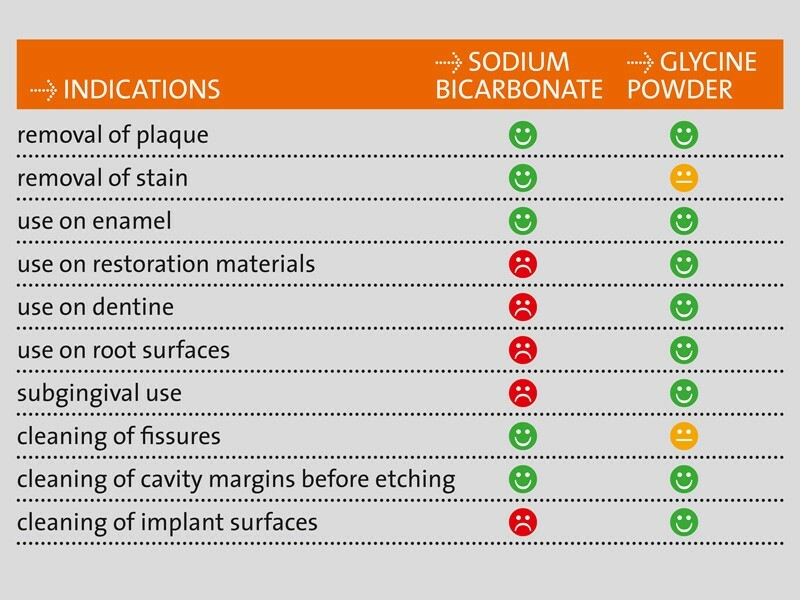 Traditionally sodium bicarbonate powders are used for air-polishing procedures. Used in a proper and not excessively intense manner, the risk of harm to the enamel is minimal. For additional applications more gentle powders have been developed during the last years. Especially glycine, a natural amino acid, opened new indications for air-polishers, the most important being subgingival removal of biofilm. 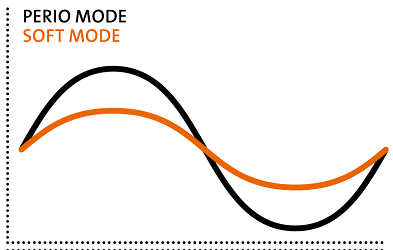 You can simply switch during the treatment between supra and subgingival air polishing by pressing prophy or perio button. 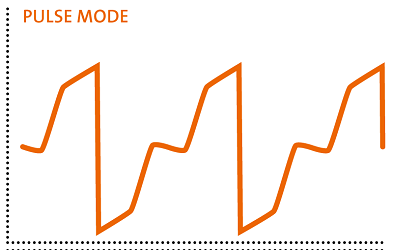 Once you switched the unit on, the tubing is cleaned by a permanent light air stream. Due to the ergonomic touch panel, you control every function as fast and intuitive as never before – and at the same time clean and disinfect the device in literally no time. Thanks to the exclusive “refill” function, you can easily remove the powder chambers without switching the unit off, for a fast and efficient maintenance. Thanks to the refill function, powder chambers are easily removable for flexible use of sodium-bicarbonate powder (prophy) and glycine powder (perio). The illuminated bottle-system lets you use different liquids (e.g. chlorhexidine in perio or sodium hypochlorite in endo). 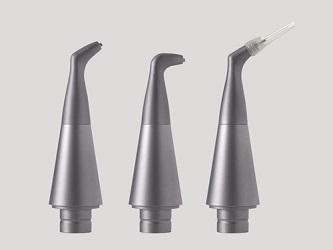 Always best access – 90° and 120° angled spray nozzles for supra- and subgingival use in periodontal pockets up to 5 mm depth. 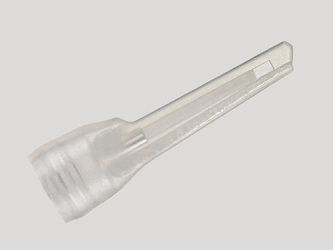 The Perio nozzle equipped with the disposable sterile Subgingival Perio Tip provides optimal access in pockets deeper more than 5 mm. 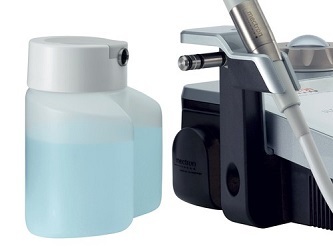 All the nozzles need just a click to get connected and they are safely fixed to the air-polishing handpiece thanks to a dedicated security connection system.